Perfect for building team spirit at cheerleading camp or to celebrate a great season together, the brunette cheerleader with red uniform is also available in blonde and African American styles and various uniform colors. These sports ornaments personalized by hand to make them memorable arrive in our classic velvet gift bag and a pretty display cord for hanging anywhere. 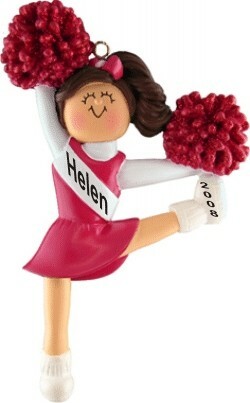 Get the rah-rahs started with the cheerleading brown w/ red uniform personalized Christmas ornament that is as perky as it is pretty. Ornament for Granddaughter Nov 5, 2016 Char W.